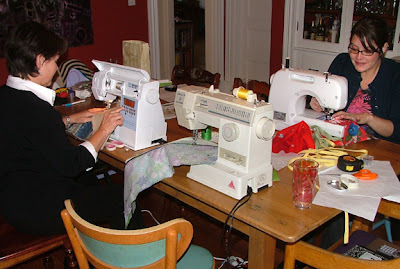 On Saturday, November 10th Beth (in the pic to the right, showing her craft apron) of Elizabeth Brennick Designs led a few Members of Boston Handmade in a sewing workshop at Jessica's house. 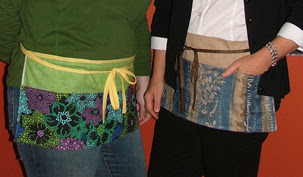 We made craft aprons and it was fun, educational, and a great bonding experience! 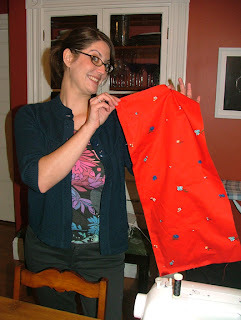 Below is a pic of Lisa (Glamourpuss Creations) showing off her chosen craft apron fabric that was a generous gift from Kris of Relaxation Works from a group fabric swap a few months ago. Beth taught us all really well and showed us some great ironing, fabric cutting, and fabric handling tips. Betsy of Stonehouse Studio however has been sewing for so many years on her own that she didn't need as much 'special attention' as Lisa and I did. We all finished lovely aprons in just a couple of short hours. Mine is on the left and Betsy's is on the right. I was so inspired by the apron success that the next day I picked up a book given to me by a weaver friend of mine named Claudia Mills and I sewed my very first tote bag from a pattern! I definitely recommend the book (see the pic below, book on the left and the tote I made is on the right). 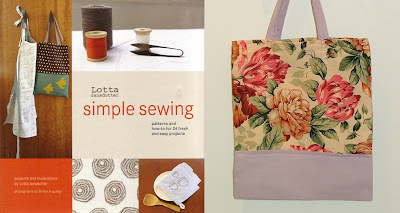 The patterns for the various projects are included, the instructions are easy to follow and I had fun making my tote! I have also made pot holders from this book which are a good short project too - and great for gifts. Anyhoo - thanks to Beth for leading this workshop and for sharing her amazing sewing skills with us! hey, the aprons look great! And way to go Jessica on the tote bag. Thanks Mimi! It was really fun to make - and I'd like to do a few more as holiday gifts to encourage friends to stop using plastic bags that stores give out. We had a blast. And I finally got around to making a craft apron that I've needed all season. Nothing like a group environment to get the DIY juices flowing! Hope we have more of these workshops!